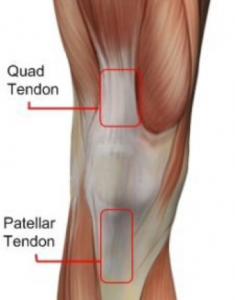 HomeUncategorized Patella Tendon Pain and Injury – Part A – some factors to consider in your assessment of causation. Patella Tendinopathy – what is it? Scans can help the diagnosis of a patella tendon injury but are not necessary. This condition is usually found in athletes who participate in sports that require repeated jumping such as basketball, netball, tennis, running, and weightlifting. 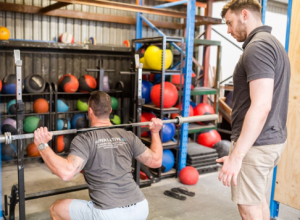 Whilst we know that increased training load is often a factor, mobility and stability of the trunk, hip, knees, and ankle should be considered in the assessment and rehab of patella tendon pain or pathology to determine what deficits may have contributed to the training load error. What are some of your squat habits (besides load) that might be contributing to your pain? Are they modifiable? This is not to say that these are wrong and it depends on the degree and intensity of these habits as to whether they are contributing to your pain. Some of those factors may be necessary for your sport or just a part of a normal variable movement. It’s important to weed out any of the weak links of your squat – especially if they can be changed. Check your ankle mobility by using this simple half-kneeling knee to wall test. Keeping your heel down, lunge towards the wall and see how far away from the wall you can get. You should be able to get a fist width (approx. 10cm) between your toes and the wall. 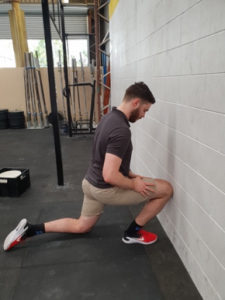 Hardly scientific, I know, but you’ll very quickly get a gauge on whether your ankle mobility needs addressing – particularly if there is genuine discomfort or pain with the test. How well can you maintain balance and the alignment of the hip, knee, and foot? How does it compare to the opposite leg? How painful is the movement? Can we load it? 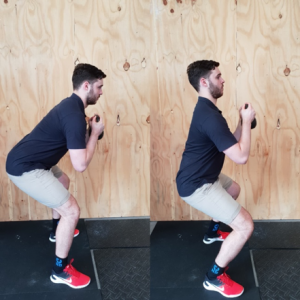 If this isn’t necessarily provoking any pain or technical flaws, the assessment can be progressed into a hop – considering all the same qualities as the single leg squat. If we consider all the same discussion points made during the squat assessment, it’s fair to say that these will translate somewhat to our jumping technique. Frequently landing with a knee strategy as pictured on the right may be a factor in terms of loading the patella tendon and may need to be modified. 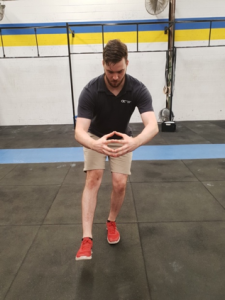 It’s been found that patients with patella tendinopathy often use the same strategy to jump and land, especially when they start to fatigue. So it seems reasonable to assume that we need to develop alternative strategies and load them to build more resilience with our jumping technique. Sometimes all of the above factors will appear normal and yet you still have pain and injury. Whilst we have already considered that a new training load (ie new exercises) OR changes in training load (ie volume, intensity, frequency) are crucial in understanding patella tendinitis or pathology, it is important to come back to these factors at this point. Sometimes this is all that has occurred to result in your symptoms, and sometimes it is a combination of the above with these factors, and occasionally it is the above factors in isolation. Either way assessment and treatment must include a thorough investigation into these. In our next blog post on patella tendinopathy you will learn some great rehabilitation exercises and strategies.